British [[Light Tanks|light tanks]] were built as combat tanks in their time, so they don't have dedicated scouting tanks (with the exception of a few US imports). At low tiers, the light tanks have somewhat higher top speeds than the mediums, but their maneuverability is almost indistinguishable. The main thing here is since they are light tanks, the game allows them to move without losing half of their camouflage value. British [[Light Tanks|light tanks]] were built as combat tanks in their time, so they don't have dedicated scouting tanks (with the exception of a few US imports). At low tiers, the light tanks have somewhat higher top speeds than the mediums, but their maneuverability is almost indistinguishable. The main thing here is since they are light tanks, the game allows them to move without losing half of their camouflage value.
? British [[Medium Tanks|medium tanks]] start out as the ponderous infantry tanks at low tiers. They have terrible armor but good guns. 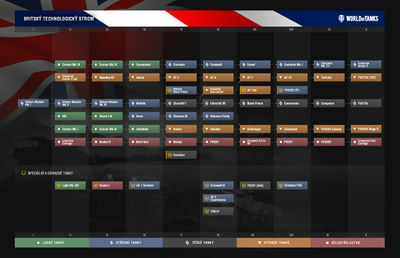 Starting at T5 the British get medium cruiser tanks which are fast with quick firing but low damage guns, then at T8 they finally evolve into powerful universal tanks, with good mobility, speed, and accuracy. + British [[Medium Tanks|medium tanks]] start out as the ponderous infantry tanks at low tiers. They have terrible armor for their tier (except the Matilda), but good guns. Starting at T5 the British get medium cruiser tanks which are fast with quick firing but low damage guns, then at T8 they finally evolve into powerful universal tanks, with good mobility, speed, and accuracy. British [[Heavy Tanks|heavy tanks]] start off as mid-tier infantry tanks, and as such are slow and ponderous, reasonable guns for their tier with an emphasis on fire rate over alpha damage. They eventually become incredibly accurate support tanks, better at moving to positions and giving covering fire than engaging head to head. They also get good on the move accuracy and low aim times. Their armour is generally on the weak side. The guns on most British heavies have more in the way of sustained DPM than alpha damage and have good penetration for their tier with the exception of the [[Black Prince]] and the [[Churchill VII]]. Training the crews for British heavy tanks is currently problematic. With the TOG II removed from the gift shop and the A45 rarely -if ever!- appearing for sale the only premium heavy tank is the low-tier Excelsior. British [[Heavy Tanks|heavy tanks]] start off as mid-tier infantry tanks, and as such are slow and ponderous, reasonable guns for their tier with an emphasis on fire rate over alpha damage. They eventually become incredibly accurate support tanks, better at moving to positions and giving covering fire than engaging head to head. They also get good on the move accuracy and low aim times. Their armour is generally on the weak side. The guns on most British heavies have more in the way of sustained DPM than alpha damage and have good penetration for their tier with the exception of the [[Black Prince]] and the [[Churchill VII]]. Training the crews for British heavy tanks is currently problematic. With the TOG II removed from the gift shop and the A45 rarely -if ever!- appearing for sale the only premium heavy tank is the low-tier Excelsior. This page has been accessed 3,062,183 times.